The Kloutocracy of it all – Do I Care...Enough? The Kloutocracy of it all – Do I Care…Enough? The machine wants me. Should I sign up? As much as I disdain Klout, the twitter universe keeps it alive (#usguys, you know what I’m talking about). So I decided to have a second look. Once there, ‘Klout Summary’ displays my amply humble Klout score, along with a few other details. 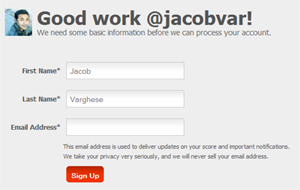 However, to show me my ‘score analysis’, Klout wants me to sign in. Having already allowed Klout to access my Twitter account, the additional request made me pause…AND brings me to the existential question. Any social media marketing or twitter denizen worth their salt has written something, somewhere, about Klout. Philosophical: In my naïve mind, the internet in general and social media (in particular), are supposed to be about non-hierarchical organization of society. As unrealistic (pragmatic me) as that idea is, metrics like Klout make it more so, encouraging hierarchically organized ‘class’ systems. Similar to ones in real life. Irrelevancy: I have noticed that, almost every one with great Klout statistics, create nary a movement on the ‘influence scale‘ as far some of my clients (and their businesses) are concerned. Chatter and back-slapping in the echo chamber can be a deceptive measure of influence. However, online marketers, social media ‘gurus’ and ‘wanna/gonna be experts‘ have the tendency to revel in auditory experiences of the echo chamber. Oh, how we love writing for each other (this post included). Then there’s our affinity for pretentiousness (read Mack Collier alluding to this in his post. Sure! ‘Be Awesome, read my book!’). But all that’s for future blog post’s. Having previously paid my token dues in the Klout debate (inspired by the writings of friend and mentor Mark Schaefer), I’ll hold off from rambling again on the subject. Should I care enough about Klout? Sign in? Only to encourage something I do not believe in? How did you derive value from signing in to Klout? By not signing in am I missing out on information that could help my clients in their online marketing efforts? Is research a good alibi? This entry was posted in Social Media and tagged Klout, Mack Collier, Mark Schaefer, marketing technologist in montreal, online marketing, Sam Fiorella, Social media marketing. Bookmark the permalink. Humbly, I would suggest you may be asking the wrong question. Although I may not personally derive value from Klout, if significant others are, I should at least be aware of it and the possible impact on customers. An extreme example would be a person who feels they do not derive value from social media and wondering if they should be involved in it. It doesn’t matter … if it is a trend affecting your stakeholders, as marketers we should learn about it and at least be able to provide counsel about it. My perspective any way. Thanks for the great post Jacob! Great Insight Mark. I must say, I am still trying to figure out HOW this trend is affecting my stakeholders. The answers are as shrouded in mystery, as how obviously complicated sets of relationship patterns, are compiled into one or two digits to present a ‘social score’. e.g. : The relevancy of Robert Scobleizer’s or Chris Brogan’s Klout score would grow less the further we move away from niche vertical interests like Tech or Marketing. Similarly, how will those scores hold up against variables like geographical areas and even social media platforms? e.g. : I recently read a post by Chris Brogan where he mentioned that he has not yet been able move much facebook traffic (in spite of being to do so in other places). In fact, I think my 13 yr old (sans Klout) would be more effective in some campaigns than Chris Brogan can hope to be. My fear is that ‘Klout’ scores are erroneous (factoring relative relevancy) at best and misleading at worst. I am afraid that just mentioning this metric to stakeholders would be overstating its importance and value, especially for those who ‘want to see’ a quick, understandable explanation. Then again, I also know many people who (like you mentioned) have decided they cannot derive any value from social media and are not involved in it. So I guess, I will have to sign up :), before I make any more judgment calls on the value of this metric. Last but not the least- Mark, I am honored that you visited (yet again) this humble outpost. As always I am grateful for your perspective. I find it kinda ridiculous too, because last time I saw it, it listed my biggest influencers being people I’ve never spoken with or tweeted about. So that had me puzzled! But it can’t really hurt. Better to be on their radar if you’re in the business you are. Besides, you HAVE to keep up with the #klout discussion amongst the guys. Kidding! Kidding! I did sign up last night. ‘Purely research’ I kept telling myself. Is it though? As of now, I really have not found anything yet that made me change my mind about the metric. However, its been less than 24 hrs since the sign in, I still have to dig into it to learn more (if there is indeed something to learn). Thank you so much for stopping by and exchanging thoughts. “…we love writing for each other”. Great line. Many people often forget that the majority of tweeps that we engage online are techno/social-savvy marketers. They represent a small portion of the real world we must influence in order to grow our businesses. Not that we shouldn’t engage them or revel in our influence within this crowd. Just as long as we’re aware of how little it means across the spectrum of ‘real-life influence’. Thanks for your visit and additional wisdom Sam! You are also right about engaging and connecting with our peers (perhaps, my post gives the impression that it does not matter at all ) while maintaining perspective of its ‘actual’ scope.